Acorn Hill Academy: Hangout with Shirley TOMORROW! I posted recently about Shirley Solis and her new parenting program. I have been so very blessed by Shirley's free videos, and the information she's shared in the two Google hangouts I've attended. As a mom of 6, Shirley has learned a lot about parenting, and her heart is to share what she's learned with parents everywhere. Her approach is child-honoring; it sets kids up for success, and gives them tools to help them remember to what they need to do and do it well. She trains her children to make a positive impact with their lives. Her tips are good for parents and kids, and designed to help your family life run smoothly. 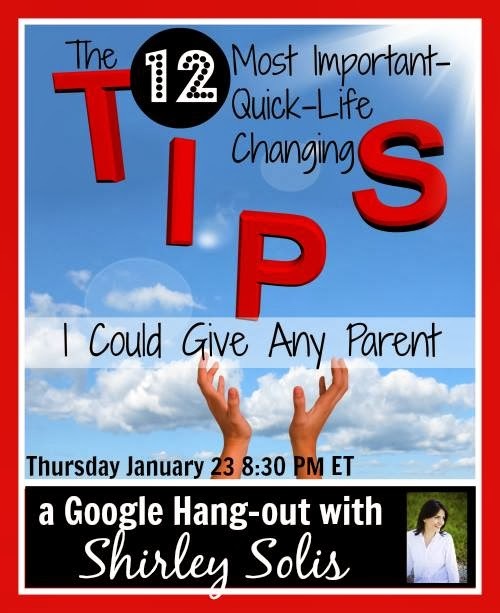 On Thursday, January 23, at 8:30 pm Eastern time, Shirley is offering another Google hangout. The topic is "The Twelve Most Life-Changing Tips I Could Give Any Parent." I'm excited to hear what she has to say! Click here for all the details and to sign up for the hangout. I want you to know I do not promote things for the sake of promotion. Shirley is wonderful, and I know you will be blessed by her teaching. Come over and join us!